A Preventative Approach to Healthcare. 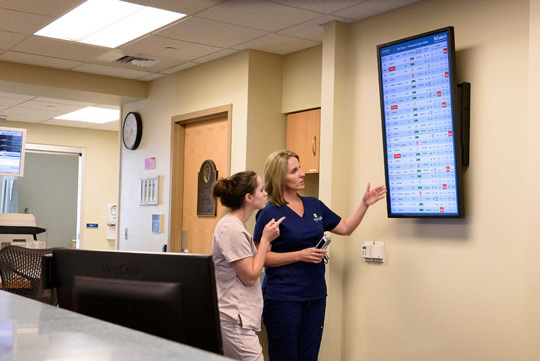 MEDI+SIGN is a connected health platform with Digital Patient Whiteboard Solutions that are designed to improve satisfaction and coordination of care. Read more about the 3rd party research to provide safety, communication and satisfaction to your patients. MEDI+SIGN patient room whiteboards replace traditional dry-erase boards in hospital patient rooms. With information that is up-to-the-minute accurate, the patients, their families and staff can benefit from knowing their pain-level, mobility status, fall risk, plan for the day and much more. The patient does not need to learn how to use complicated keyboards or user interfaces and the nurses do not need to learn new software. Simply document into the EHR and MEDI+SIGN does the rest. 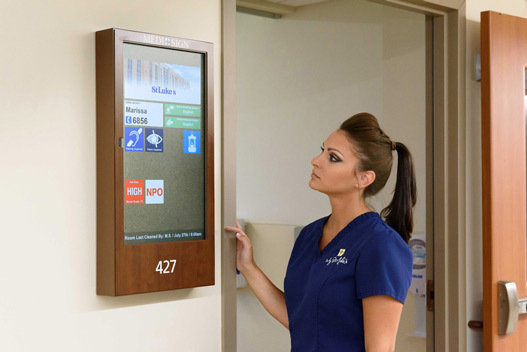 MEDI+SIGN digital door displays alert physicians, nurses and other hospital staff of important information prior to entering each patient’s room. Up-to-the-minute accurate information, including Isolations, nurse assignments, dietary restrictions and other alerts make using the door display as intuitive as looking at a clock. 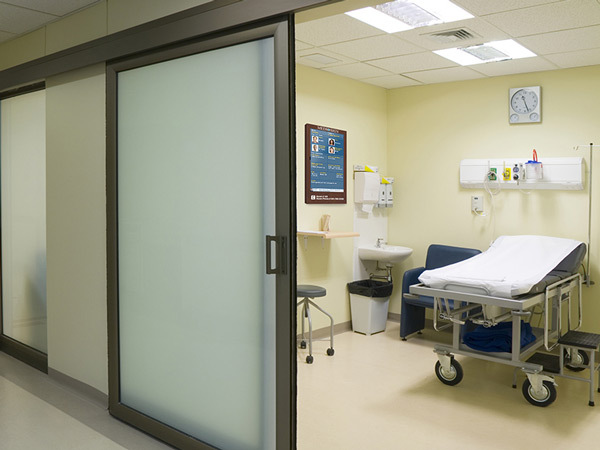 Electronic Patient Room Door Displays are ADA compliant, can be made to match the hospitals aesthetics and come standard with tactile room identifications and international braille. 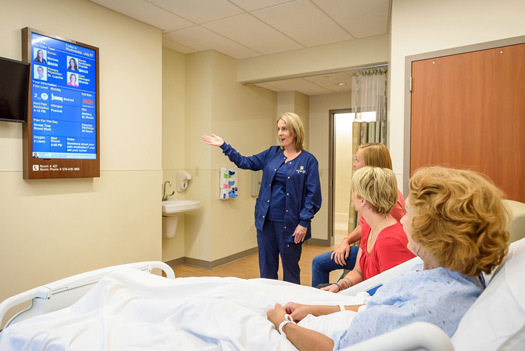 MEDI+SIGN digital displays for nurses’ stations update the care team on round and pain medication schedules, as well as the patient’s pain level and pain level trend. At a glance, staff can see all safety conflicts in the patient room with Anti-Fall™ technology. MEDI+SIGN digital exam room whiteboards for Emergency Departments bring critical information and alerts in real time to patients in emergency exam rooms. Housed in a smaller package to better fit the tight spaces in these rooms, MEDI+SIGN’s digital exam room whiteboard solution is engineered to be most effective for information needed during the short period of time the patient will be in the Emergency Department. When paired with smart hospital beds, MEDI+SIGN can help reduce the frequency of patient falls in hospitals. 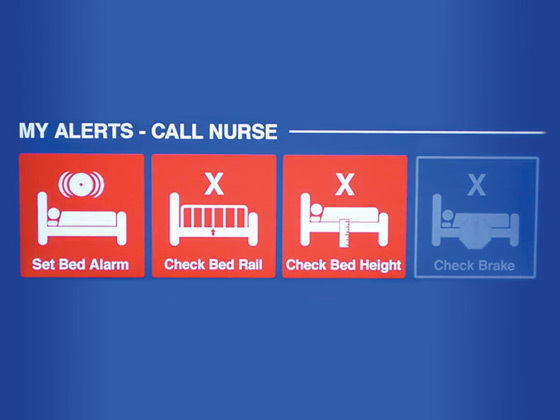 With patent-pending algorithms, MEDI+SIGN can determine the fall risk of the patient, check the condition of the bed and display any safety conflicts to all of the MEDI+SIGN display solutions.